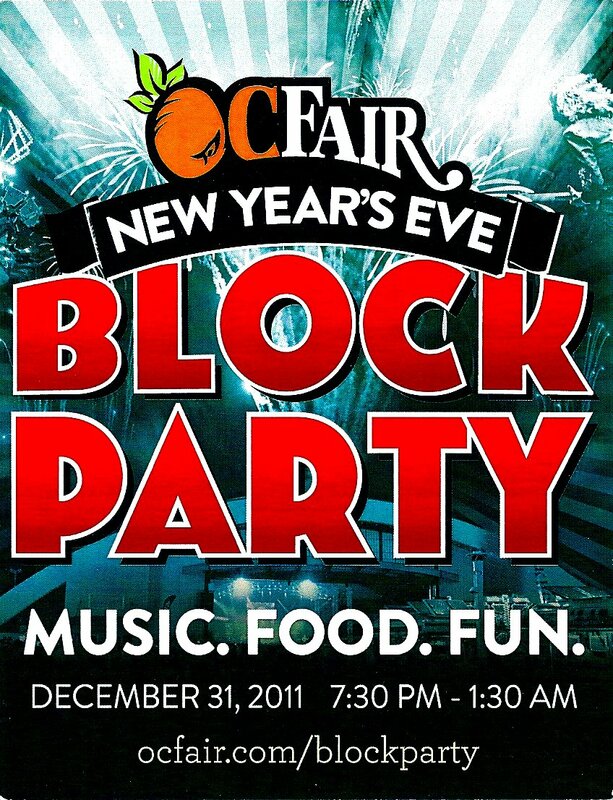 Win Tickets To The OCfair’s New Year’s Eve Block Party 2011! Got plans for New Year’s Eve??? WELL YOU DO NOW! The talented people who bring you the OC Fair every summer, return with their 2nd annual NEW YEAR’S EVE BLOCK PARTY, Saturday night the 31st of December 7:30pm-1:30am. This is gonna rock, and unlike other NYE celebrations, OC Fair’s NYE Block Party has so many fun things to watch, do AND eat (my particular favorite)! New this year is the Casino, where high rollers will be able to ‘gamble’ for some fantastic prizes. All attendees will also be enjoying rides, the bands and at midnight, a pyrotechnic show to ring in 2012! So many awesome GFTs to choose from. I’m personally salivating for The Greasy Wiener, Grilled Cheese Truck, Taco Maria, Chunk N Chip, Baconmania and The Burnt Truck. I may just have to bring to a cooler to take home good eats for New Year’s Day. You probably will see (hopefully not hear) me singing my heart out to the RIO – the Duran Duran tribute band. So in order to win these TWO tickets, to a sure bet fun time, leave a comment below with what you are looking forward to in the new year. I know I can’t wait for more great eats and a culinary adventure to Portland’s food cart courts and a Tillamook Cheese Factory tour just over the New Year hump. Video fun from last year’s NYE Block Party can be previewed here. I will announce the WINNER on Christmas Day? or Christmas Eve? Tag in your comments below what you’d like better, winning tickets as a stocking stuffer OR as an awesome Christmas Gift? 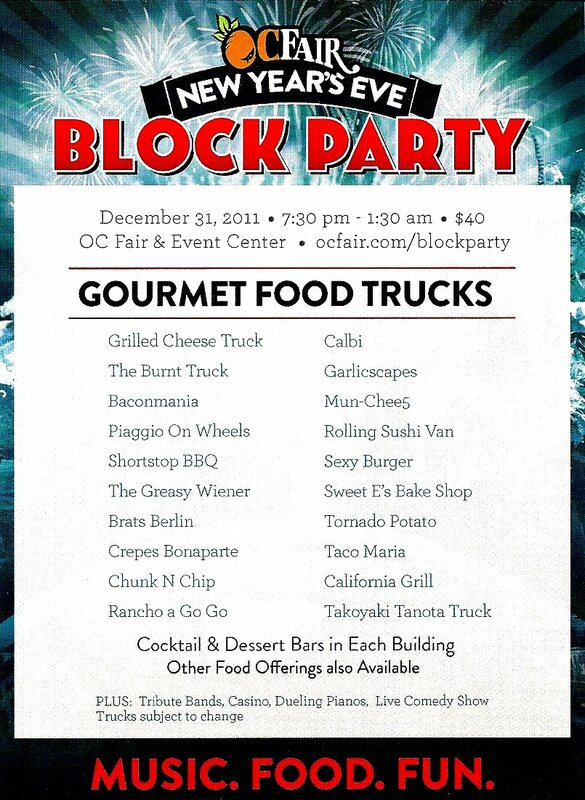 Looking forward to seeing you there and sharing an OC Fair NYE Block Party drink with you! Thank you so much for being able to use the tickets when Kanani couldn’t. What a great night. After a 2 outta 3 count, Kanani you’ve won the tickets! Please email me your contact information so I can get these to you ASAP. Thank you and Jen both for posting. Happy New Year to you both!